“Will history rate George W. Bush as the worst President ever?” At least half of Americans thought so a decade ago. During his presidency his approval ratings soared after the greatest terrorist attack on American soil. Then they bottomed out near the end of his term as the conflict in the middle east trudged on. A president’s son with all the privilege in the world — he was a party boy in his youth — and he was never expected to enter politics. What made him follow in his father’s footsteps? And, what is he up to today? Let’s dive into the life of America’s 43rd president, George W. Bush. George Walker Bush was the first of six children born to George H.W. Bush and Barbara Pierce Bush on July 6, 1946 in New Haven, Connecticut. The Bush family was well-off — theirs was a prominent northeast banking family and later, a political dynasty. At the time of Bush’s birth, his father George Sr. was an undergraduate student at Yale University. Immediately after graduating in 1948, George Sr. broke with family tradition and moved his young family to the boom towns of West Texas to try his luck in oil. But, at their first apartment in Odessa, the Bush’s had to share a bathroom with neighboring prostitutes. In 1950, the family settled in Midland, Texas — once referred to as the “headquarters of the independent oil man.” At the time, 215 oil companies had offices there. Bush Sr. would eventually earn a fortune in the oil business — making millions by the time he was 40 years old. The first family home in Midland was in a development nicknamed “Easter Egg Row,” for its tiny, colorful houses. As the Bush family grew however, they needed more space so they moved to a larger home on Ohio Avenue in 1951. “Georgie,” as he was often called, was five years old at the time. Today, Bush’s childhood home is listed on the National Register of Historic Places and is open to the public six days a week. Bush enjoyed an idyllic, Baby Boomer childhood growing up in West Texas. The neighborhood was safe and full of young families. He played baseball — idolized the great Willie Mays, and developed friendships that remained throughout his life. The Sam Houston Elementary School was not far from his house. In 1953, tragedy struck the Bush family when three-year old Pauline “Robin” was diagnosed with a strange disease neither Barbara or George Sr. had heard of before: leukemia. Despite their best efforts — taking her far from home for treatment in New York’s Sloan Kettering cancer center — Robin died seven months after the diagnosis. George Jr. was seven and had not known his sister’s grave condition. After her death, his parents picked him up from school in the big green Oldsmobile. He recalled years later being positive he saw his sister in the backseat — and he was excited, and ran to the car to see her. When his parents broke the news he understood she was gone, and it changed all their lives forever. Some say the loss of Robin was the impetus for the deep, mother-son bond George Jr. and Barbara formed. They spent a lot of time together after her death. 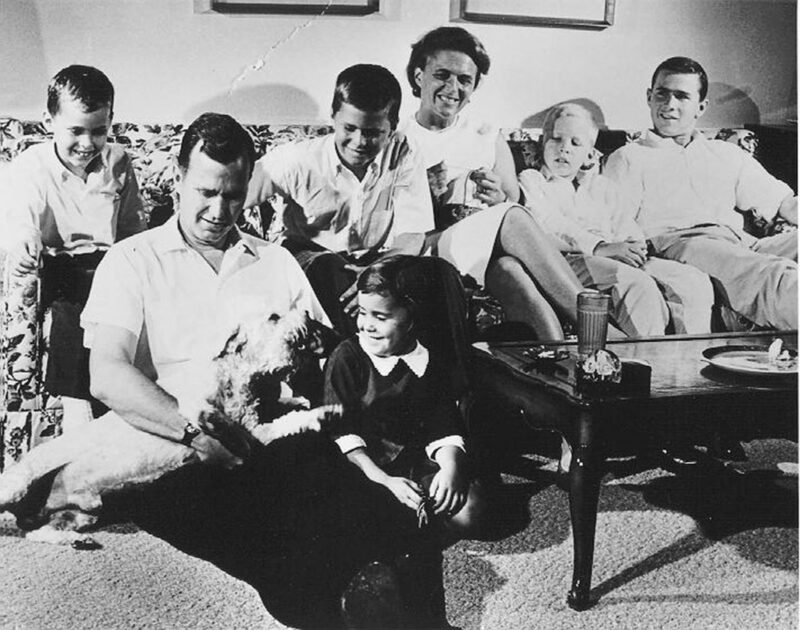 Eventually, the Bush family added three more children to the clan, including Neil in 1955, Marvin in 1956, and another daughter, Dorothy in 1959. That same year, with George Sr.’s success in the oil business, the Bush’s relocated to Houston. In 1960, the fourteen year old Bush was sent away to attend the exclusive all-boys boarding school Phillips Academy in Andover, Massachusetts. Here, he lived in the shadow of his more successful, alumnus father. For a fun-loving Texan, Phillips was a drastic change. The curriculum was rigorous, the environment was ultra-structured, and it was cold. Bush was envious of his buddies back home — they got to take their girlfriends out on Friday night dates. With no social life to speak of, he played sports instead. Academics did not come easy for Bush either — he received a “zero” on his first written assignment. Not wanting to fail, Bush spent many nights at Phillips after curfew studying by the light that seeped under his door. He developed a love of American history during his high school years and said later, he would “bloom where he was planted.” In his adult life Bush acknowledged receiving a first-rate education at Phillips. 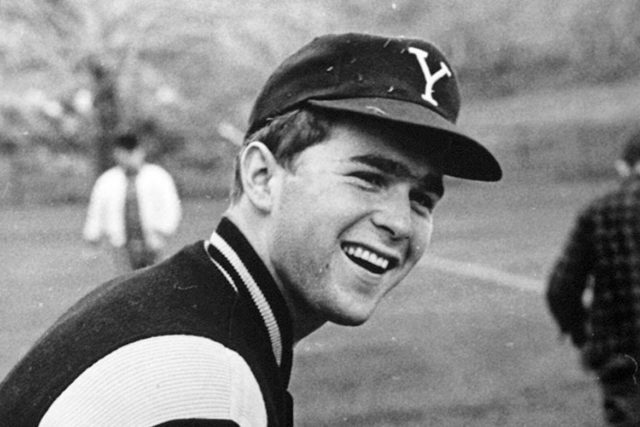 George W. Bush poses during his Yale University Years, 1964-1968. In 1964, when it was time to go on to college, Bush chose his father’s, and his grandfather’s alma mater, Yale University. During his freshman year, his father decided to run for Texas Senate and called upon his son for help. Bush Jr. worked on the campaign — doing what he could from Connecticut. The elder Bush lost but the it proved to be a valuable, first-time learning experience for George Jr.
Bush graduated with a bachelor of art degree from Yale in 1968. The same year Martin Luther King Jr. and John F. Kennedy were assassinated and the war in Vietnam was raging. In May of 1968, Bush was commissioned into the Texas Air National Guard. After two years of training in active-duty service, he was assigned to Houston, flying Convair F-102s with the 147th Reconnaissance Wing out of the Ellington Field Joint Reserve Base. 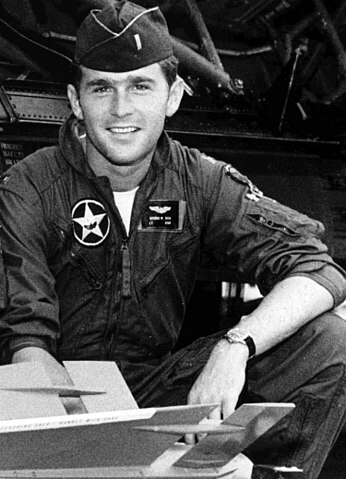 George W. Bush in the Texas Air National Guard, where he served from 1968 to 1973. During his presidential campaign in 2004, critics of Bush, including Democratic National Committee chairman Terry McAuliffe, accused him of receiving preferential treatment while in the service and of being absent without leave (AWOL) from 1972 – 1973. Following the controversy, the Department of Defense released all records related to Bush’s Texas Air National Guard service in June 2005. According to his released records, Bush never flew in the Air National Guard after April, 1972. His pilot license had been revoked for failure to undergo the mandatory physical examination. In 1972, Bush was living in Montgomery, Alabama and working on the U.S. Senate campaign of Republican Winton M. Blount. While in Alabama he drilled with the 187th Fighter Wing of the Air National Guard. Bush was honorably discharged from on November 21, 1974. In 1973, Bush entered Harvard Business School and graduated with an MBA in 1975. Soon after in 1977, he began his industry career in Texas oil, establishing Arbusto Energy with a number of other private investors. Operations began the following year in 1978. Bush was not as successful in the oil business as his father and he sold Arbusto in 1984 to Spectrum 7, another Texas gas exploration firm. He remained the CEO under the terms of the sale. In 1986, Spectrum 7 merged with Harken Energy Corporation where Bush held a seat on the board of directors and retained an annual consulting contract. In 1988, Bush was working on his father’s bid to become the next president of the United States when he learned his father’s friend and fellow oil man, Eddie Chiles, was selling the Texas Rangers baseball franchise. Not wanting this opportunity to slip by, Bush helped organize a syndicate to purchase controlling interest in the team — at a reported 89 million. Bush became the general manager even though his initial investment was small at $500,000. Bush took out a loan to pay for his share. In 1990, Bush sold his Harken stock to help pay the balance of the loan he had taken out to purchase the Rangers. Two months after the sale however, Harken released its quarterly numbers — showing a larger-than-expected loss. Insider trading allegations erupted and the sale of Bush’s stock was investigated by the U.S. Securities and Exchange Commission who ultimately found no wrongdoing. In 1977 Bush was invited to BBQ at his friend’s house in Texas. The only other guest was woman Bush had never met — even though she was from Midland too. Bush was enamored with the beautiful teacher and librarian Laura Lane Welch and the two fell in love almost instantly. It was a short, whirlwind romance before they wed three months later on November 5, 1977. The couple settled in Midland and in 1981, the couple had fraternal twin daughters, Jenna and Barbara. Soon after his marriage to Laura Bush joined the United Methodist Church and became a born-again Christian. The day after his 40th birthday on July 6, 1986, Bush gave up drinking alcohol for good. Bush decided to run for governor of Texas as a Republican after his father failed to win the presidential re-election in 1992. As manager for the Texas Rangers, Bush had earned a reputation as a savvy businessman and he was well-liked in his home state. His campaign against Democrat Ann Richards focused on welfare and tort reform, reducing crime and improving education. The Richards camp was sure Bush would make a gaffe or lose his temper on the campaign trail but he never did. It was a close race and a contentious one. Bush won the election with 53 percent of the vote and was sworn in as the 46th Governor of Texas in 1995. He became the first child of a U.S. president to be elected as a state governor. In 1998, he was re-elected with 69% of the vote and became the first governor in Texas history to be elected to serve two consecutive four-year terms. A criticism of his time in office was the fact that under his leadership, Texas executed 152 prisoners — at the time, it was more than any other Texas governor. Overall, Bush had the reputation for working well across the aisle in a non-confrontational way, and this earned him respect. And, throughout his first term and after his successful, easy re-election, speculation increased as to whether Bush would make a bid for the White House. On June 14, 1999, Bush formally announced his candidacy for the Republican presidential nomination. English: Official photograph portrait of former U.S. President George W. Bush. During the early part of the 2000 campaign Bush enjoyed a double-digit lead in the polls over his opponent Vice President Al Gore Jr. As the election approached, the gap narrowed and Gore beat out Bush in the popular vote by 543,895. With the deciding votes hanging on Florida, the race was determined “too close to call” by major news networks after first proclaiming Gore the winner. The margin was so close it spurred a recount in some counties as lawsuits made their way through the courts. 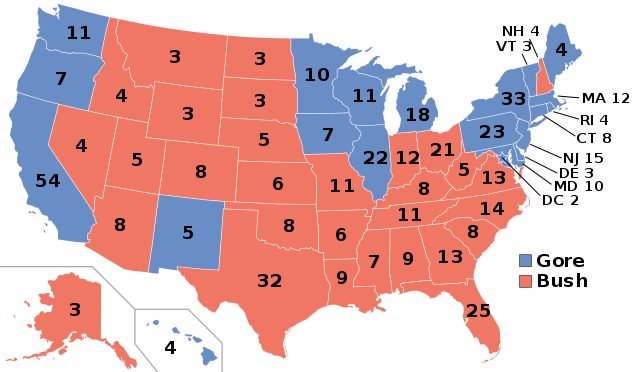 The final electoral count was Bush with 271, and Gore with 266. To this day, only five U.S. presidents have lost the popular vote and won the election. Bush was sworn in as America’s 43rd President on January 20, 2001. For the second time in history, a son of a former president had made it to the White House. The first was the sixth president John Quincy Adams, elected in 1824. His father was John Adams, the second president. On the morning of September 11, 2001, 19 men trained by al-Qaeda carried out a coordinated terrorist attack on the United States — hijacking four large passenger airplanes with the intention of crashing them into major landmarks. Three of the four planes hit their targets — the North and South Towers (Twin Towers) of the World Trade Center, and the Pentagon in Arlington, Virginia. The fourth plane crashed in a field in rural Pennsylvania. In a single day, these deliberate acts of mass murder killed nearly 3,000 people, 400 of which were first responders. As the attacks were happening, President Bush sat in a classroom at Emma E. Booker Elementary School in Sarasota County, Florida with children, reading The Pet Goat. White House Chief of Staff Andrew Card whispered in his ear, informing him a second plane had hit the World Trade Center. What President Bush did next was one of the most controversial decisions of his presidency. He stayed in the classroom for seven more minutes, following along with the students’ reading before excusing himself. He was briefed and gave a short press conference while at the school before being taken to a secure location to board Air Force One. Michael Moore, in his film Fahrenheit 9/11, was highly critical of Bush’s seven minutes of inaction in the classroom– claiming it indicated Bush was indecisive. On the other side, his defenders made the case for keeping the children calm — saying it was Bush’s most important duty at the time. President George W. Bush addresses the media at the Pentagon on Sept. 17, 2001, following a meeting with his national security team and leaders of the National Guard and Reserve forces. Seated at the left is National Security Advisor Condoleezza Rice. In response to the terrorist attacks of 9/11, Bush declared War on Terrorism and formed a new cabinet-level Department of Homeland Security. He sent American forces into Afghanistan to break up the Taliban, an extremist group under Osama bin Laden that trained, financed, and exported terrorist teams. The Taliban was disrupted but Bin Laden was not found until later. Following the attacks, President Bush also recast the nation’s intelligence gathering and analysis services, and ordered reform of the military forces to meet the new enemy. At the same time he delivered major tax cuts which had been a campaign pledge. His most controversial act was the invasion of Iraq on the belief that Iraqi President Saddam Hussein posed a grave threat to the United States by possessing weapons of mass destruction. The weapons were never found. Saddam was captured but American servicemen and friendly Iraqis lost their lives during the conflict. In his State of the Union address in 2005, Bush pledged that the U.S. would help the Iraqi people establish a fully democratic government, bring hope to the region, and lift a threat from the lives of future generations. Previous ArticlePablo Escobar Biography: Colombian Drug Lord and Narcoterrorist.